That photo is from February 13, 2011 when we suffered a very, very cold night when my blueberries were in full bloom. 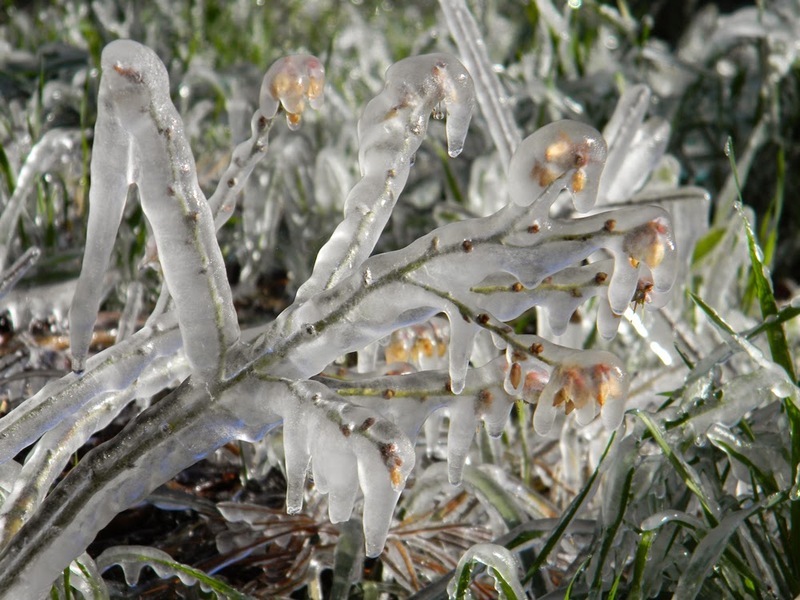 I ran the sprinkler all night on my bushes, covering them with icicles, much to the amusement of my children when they woke up in the morning. We kept the sprinkler running until all the ice melted sometime in the middle of the day. Using sprinklers for frost protection is a trick used by professional growers to save blooms and young fruit from frost. You’d think it would totally wreck the plants but it doesn’t. In fact, it keeps the plants hovering right around freezing without letting them freeze all the way through, thanks to the slight heat caused by the phase transition from liquid to solid. Really cool. That year we got blueberries. This year, I’m running a sprinkler on my two peaches and my Illinois Everbearing mulberry since they’re all three loaded with fruit. The low here tonight is supposed to be around 22-23 degrees. Freezes are supposed to affect the state all the way down into Orlando. Be sure to cover plants and get ready or you may miss a year’s worth of fruit. I’ve got more frost protection tips in this video. How to make cane syrup at home... without a sugar cane press! If this is any indication of the kind of climate you have, I'd have no anxiety about the likely success of your apples (except for the humidity => fungal infection factor). I live in Melbourne, Australia, and we get barely three light frosts a year, but there's sufficient chill for apples (I have Granny Smith, Pink Lady, Cox's Orange Pippin, Fuji, Gravenstein, Berner Rosen, Boswell, Snow, a recent Australian cultivar called Huonville Crab, and some from the Ballerina columnar range). Thanks, Alexis. You have some great varieties. I'm hoping for success despite our humidity.